Yaaaaaas, it is that time of the year again! IPL fever is on the rise, and cricket buffs in Hyderabad are cheering hard for their favourite teams and players. Looking for the best IPL Screenings in Hyderabad? We've got you covered. This IPL season, don’t just wear the Sunrisers Hyderabad (or whichever team you're rooting for) jersey, but gather your cricket crazy fam at one of these places and cheer for every chakka together. Mexican food, delicious cocktails, and a large group watching IPL together! If you are game for this, head to Chili's American Grill & Bar. 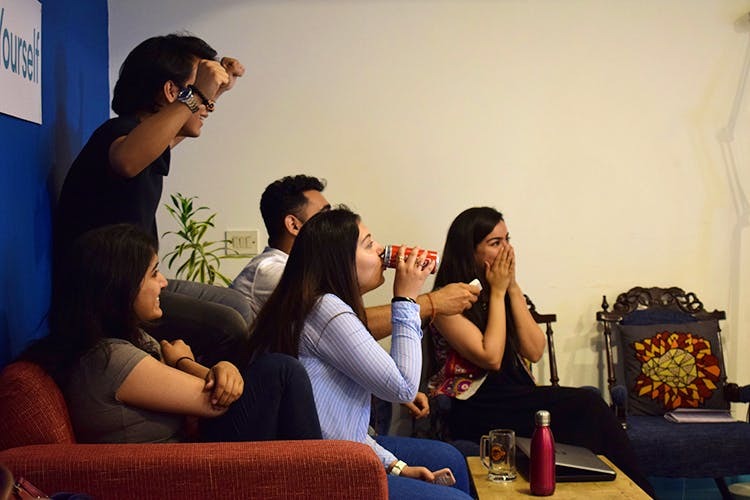 Known as one of the best bars in Hyderabad for live match screenings, the atmosphere of this bar (on a screening day) literally transports you to the stadium. So, drag your squad and be ready to get your eyes glued to the screen! B-Dubs has nearly 70 TVs, large screens, and a massive projector screening the live matches. It can get quite crowded so make sure to reach in advance and choose the best spot in the house to watch your game. The crowd is super energetic, and you can dig into chicken wings and chug down beer as you watch the match. HyLife in Jubilee Hills has a large (we mean, really large) screen in their outdoor seating, and no matter which floor you are in, you can watch the match in peace. The ambience has a grunge look with a jeep hanging right in the centre of the place. Go here on an evening match screening and enjoy your pint as you watch the players. This Gachibowli bar has three screens playing live matches with two of them being outdoors and the other indoors. You can go here for some lip-smacking Italian food and beers in their terrace lounge. They have happy hours available between noon-7 pm every day. So, a game of cricket and drink deals do sound like happier hours, doesn't it? Barcelos in Kukatpally is where you can catch some action on IPL. This bar is very much laidback like us, and you can devour some delicious African or Portuguese dishes and signature cocktails as you root for your favourite team. Go here with your bae and watch the match. Be sure to take full advantage of their happy hours. All your dreams of watching a live screening in a Goan shack is coming true with 84 Anjuna Shack. Corporate crowd and students rub shoulders with each other as they watch IPL here. Make it a meal with Goan Fish Thali or Goan Pork Thali as you cheer for your favourite team. A.S. Rao Nagar's very own party place, Up Bar comes alive during the IPL season. This is an airy rooftop bar with a breathtaking view of Maula Ali Hills. Known for its chill vibes, tuck into barbecue dishes and ask for a round of cocktails and make it an IPL partaaay! Beaming yellow walls and glossy blue doors and windows, Beach House in Madhapur is where you can escape from Hyderabad and step right into Goa. But this is also where you can sit in a large courtyard (under the canopy of trees) and watch IPL Screenings. Do call in advance to check the schedule (because they plan other events as well), but don't miss out as they serve liquor and food at pocket-friendly prices. Fat Pigeon - Bar Hop is the place to be in during the IPL season or any live match screenings. The crowd is super eclectic, and you'll have a blast watching a match here. They update their calendar with all the timings and screening schedules in advance on their social media profiles. So, stalk their schedule and get here!